Protein aggregates analysis is an emerging and expanding field in the biopharmaceutical industry. One of the key factors affecting the stability of proteins is their tendency to form aggregates (randomly-forming multimers) in solution, especially when exposed to unfavourable storage conditions. For biopharmaceutical products, aggregates must be strictly controlled because they eventually form particulates that cause serious immunological responses when administered, besides the fact that aggregates are no longer biologically active. Although size-exclusion chromatography gives some measure of aggregate formation, it lacks the resolving power to determine the exact state of aggregate formation. 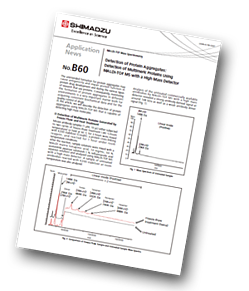 This article describes high-resolution analysis of immunoglobulin aggregates by MALDI-TOF MS (AXIMA-Performance) in combination with high-mass detector that enables ion detection up to 1,000,000 m/z. Here, aggregation was induced by repeated freeze-thaw cycles or by heat, and the data was compared with the original state to demonstrate the relative abundance and molecular weight of the aggregates formed. This MALDI-TOF MS method can be easily implemented and the data given is both intuitive and informative.